YAKIMA, Wash. Six underground tanks that hold a brew of radioactive and toxic waste at the nation's most contaminated nuclear site are leaking, federal and state officials said Friday, prompting calls for an investigation from a key senator. Washington Gov. Jay Inslee said the leaking material poses no immediate risk to public safety or the environment because it would take a while  perhaps years  to reach groundwater. But the leaking tanks raise new concerns about delays for emptying them and strike another blow to federal efforts to clean up south-central Washington's Hanford nuclear reservation, where successes often are overshadowed by delays, budget overruns and technological challenges. Department of Energy spokeswoman Lindsey Geisler said there was no immediate health risk and said federal officials would work with Washington state to address the matter. 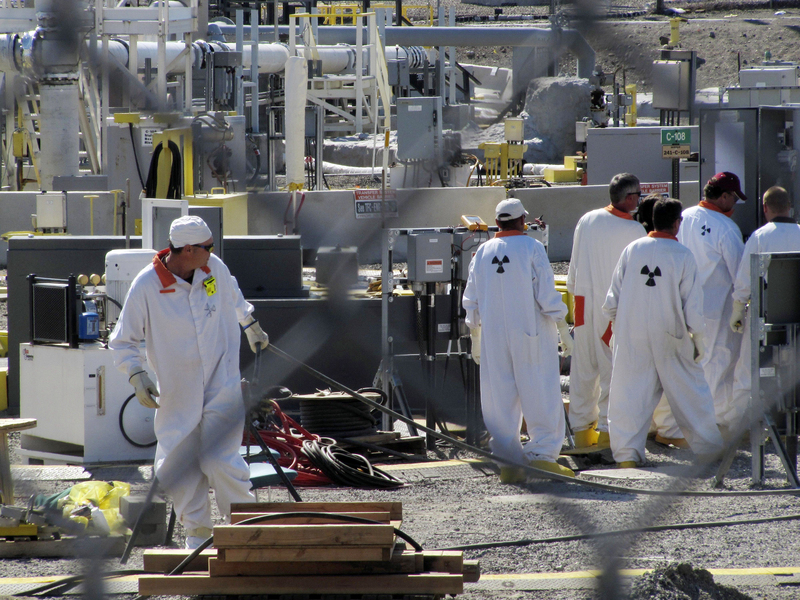 Regardless, Tom Towslee, a spokesman for Sen. Ron Wyden, D-Ore., said the senator will be asking the Government Accountability Office to investigate Hanford's tank monitoring and maintenance program. Wyden is the new chairman of the Senate Energy and Natural Resources Committee. State officials just last week announced that one of Hanford's 177 underground tanks was leaking 150 to 300 gallons a year, posing a risk to groundwater and rivers. So far, nearby monitoring wells haven't detected higher radioactivity levels. Inslee traveled to Washington, D.C., this week to discuss the problem with federal officials. He said Friday that he learned in meetings that six tanks are leaking waste. The federal government built the Hanford facility at the height of World War II as part of the Manhattan Project to build the atomic bomb. The remote site produced plutonium for the bomb dropped on Nagasaki, Japan, and continued supporting the nation's nuclear weapons arsenal for years. Today, it is the most contaminated nuclear site in the country, still surrounded by sagebrush but with Washington's Tri-Cities of Richland, Kennewick and Pasco several miles downriver. Hanford's tanks hold some 53 million gallons of highly radioactive waste  enough to fill dozens of Olympic-size swimming pools  and many of those tanks are known to have leaked in the past. An estimated 1 million gallons of radioactive liquid already leaked there. The tanks also are long past their intended 20-year life span  raising concerns that even more tanks could be leaking  though they were believed to have been stabilized in 2005. Inslee said the falling waste levels in the six tanks were missed because only a narrow band of measurements was evaluated, rather than a wider band that would have shown the levels changing over time. There are legal, moral and ethical considerations to cleaning up the Hanford site at the national level, Inslee said, adding that he will continue to insist that the Energy Department completely clean up the site. He also stressed the state would impose a "zero-tolerance" policy on radioactive waste leaking into the soil. Cleanup is expected to last decades and cost billions of dollars. The federal government already spends $2 billion each year on Hanford cleanup  one-third of its entire budget for nuclear cleanup nationally. The Energy Department has said it expects funding levels to remain the same for the foreseeable future, but a new Energy Department report released this week includes annual budgets of as much as $3.5 billion during some years of the cleanup effort. Much of that money goes toward construction of a plant to convert the underground waste into glasslike logs for safe, secure storage. The plant, last estimated at more than $12.3 billion, is billions of dollars over budget and behind schedule. It isn't expected to being operating until at least 2019. "We are not convinced of this," he said. "There will be a robust exchange of information in the coming weeks to get to the bottom of this." Inslee and Oregon Gov. John Kitzhaber have championed building additional tanks to ensure safe storage of the waste until the plant is completed. Sen. Ron Wyden, D-Ore., said earlier this week that he shares their concerns about the integrity of the tanks but he wants more scientific information to determine it's the correct way to spend scarce money. Tom Carpenter of Hanford Challenge, a Hanford watchdog group, said Friday it's disappointing that the Energy Department is not further along on the waste treatment plant and that there aren't new tanks to transfer waste into. "None of these tanks would be acceptable for use today. They are all beyond their design life. None of them should be in service," he said. "And yet, they're holding two-thirds of the nation's high-level nuclear waste." Wyden noted the nation's most contaminated nuclear site  and the challenges associated with ridding it of its toxic legacy  will be a subject of upcoming hearings and a higher priority in Washington, D.C.